Nityanand Jayraman has a piece in Scroll.in which is a damning indictment of Hindustan Unilever’s role in contaminating a thermometer factory site in Kodaikanal with mercury. The sordid story carries the usual villainy of an evil corporation that puts its commercial interests above the safety of its workers, the community around it and the environment. While this was a while ago, things haven’t changed much. Even today, we see this movie playing out, in company after company, around the world. Unilever dumped broken thermometers at the site and let the mercury leach into the ground. It did not train its workers adequately in safety procedures. And when confronted with the clean up after the government shut down the factory, it argued for laxer standards and denied wrongdoing. Pretty standard fare for such cases. What makes the story uglier though, is that this thermometer factory in Kodaikanal was moved from Watertown in New York state in 1980, after the US started cracking down on environmentally hazardous factories. The standards that the US was pushing for made it economically unviable to operate. However, environmental regulations in developing countries like India are either weak or weakly enforced. So Unilever moved the factory and its accompanying hazardous contamination to India. This is called regulatory arbitrage. It takes a special kind of villainy for a company to do this. The factory operated from 1980 to 2001, when the Tamil Nadu government shut it down and asked Hindustan Unilever (HUL) to clean up the site. HUL has done some work but is negotiating on the extent of the clean up required, which is what led to this video. The video, by the way, is brilliant – an example of how art can be put to work by activism. Without the video, the reach of this message would be a hundredth of what it is now. Hindustan Unilever was my first job out of business school. Hindustan Lever or HLL as it was known in those days was the top Consumer Packaged Goods job for business grads in those days. I was proud to be working for them. They had the absolute best management training program in the industry. For 18 months we got the kind of cross-functional training that was the envy of every management graduate. As part of it, we had to spend 4 months in a village in rural Uttar Pradesh and work on a rural development project. HLL had a Rural Development Program that truly helped the villagers in a very backward area of the country. I thought I was working for a company that was not just a well managed company, but also a company that wanted to give back. Soon the scales fell from my eyes. It wasn’t really managed very well. I was a junior manager and had very little visibility into top management decisions. But even from my vantage point I could see that the company treated its distributors very poorly. Dumping or channel stuffing was so common that the trade often had months of stock – ruining their economics and the stock of tea they carried (I was in Lipton). The top management knew this was happening but couldn’t bring themselves to stop the practice. At the time, this was befuddling to me. Doesn’t someone at the top have the courage to tell headquarters that we have to reduce stock levels in the channel even if it means a bad quarter? But I was young, and naive. Now, of course, I have a better understanding of these matters. Managers are poor agents for shareholders. Shareholders themselves are poor long-term stewards of public companies. They can sell and get out at any time. But while they hold stock in the company, nobody wants a miss on a quarter. You can look at management making self-serving short-term decisions that hurt the company in the long-term (while quoting Keynes “…in the long term we are all dead” with a smirk on their faces) and shake your head and say “Such is human nature.” But when they knowingly poison the ground and kill unborn children, it makes your bile rise to your throat. I worked at HLL from 1989 to 1994. The thermometer factory was in full production at the time. The top executives that interviewed me and confirmed me from a management trainee to a manager – the Chairman of the company and several high-ranking executives – probably knew that mercury was going into the ground in Kodaikanal. It makes me sick, just thinking about it. If you want to be charitable to them, you might choose to think that they didn’t know. They just never went near it, never reviewed its operations, afraid of what they might find. Still, they are guilty of neglect and willful ignorance. Today’s Unilever is a very different place. Ironically, the company seems to have bet its future on its Sustainable Living Plan. Many of its brands are positioned primarily on what they do for the planet. The screenshot above is from Unilever’s company website. 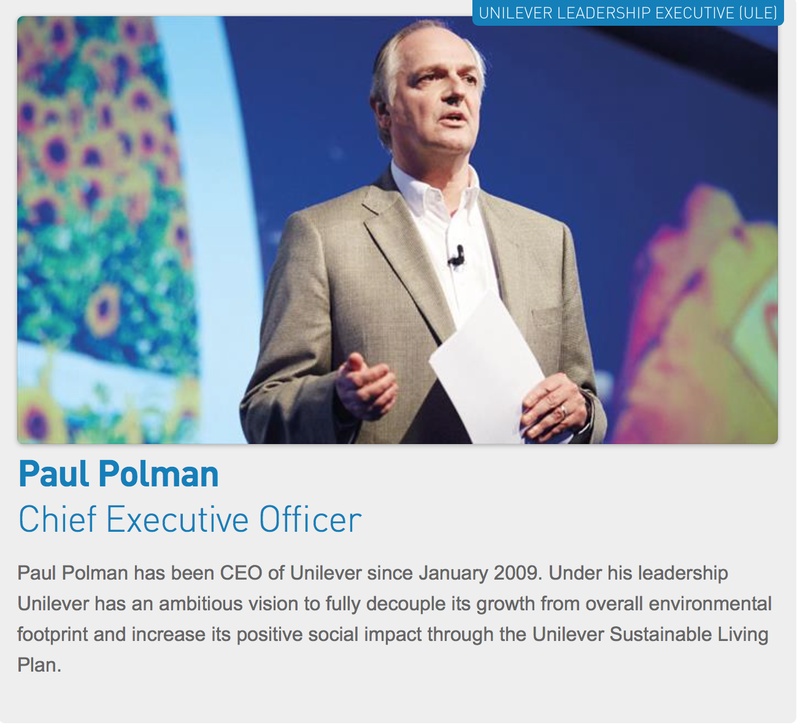 The blurb under CEO Paul Polman’s picture talks solely about Unilever’s Sustainable Living Plan. All this is quite creditworthy and I hope they are successful. But they must pay for their past sins. I hope Hindustan Unilever cleans up the site and compensates the victims. It would be the right thing to do and it would be good business too. You can’t be betting the company’s future on Sustainable Living while fighting a PR battle about dumping toxic waste in a third world country. But what I know will not happen is that no former executive will be held responsible. That just never happens. Pay a fine. Take a temporary hit to earnings. And move on. That’s not real deterrence. But that’s the best we can expect. Whether you are leaching mercury into the ground water or bringing down the world’s financial edifice, you can feel safe that the company you work for has your back. This entry was posted in Uncategorized and tagged Business, India, Sustainable Living. Bookmark the permalink. 5 Responses to Are There No Good Companies? Reblogged this on Conclave of Dreams. Sir do you think mandatory CSR activities are enough to cover up weak environmental regulations in developing countries like India ?